The MCE series consists of several SCE cell connected in serial or paralle. Because of different voltage or capacitor in application, MCE Series can be customized according to customers’ requirements. 90V、160V modules are common. According to different from of inner cell, PCB welding or screw connection are adopted. The outer is iron or plastic shell with terminal block. MCE series, which belongs to energy storage capacitor, is suitable for applications that require a higher power. They are used as backup power in energy storage associton,such as wind turbine pitch、jumpstart、DTU/FTU、smart and micro grid,ect. MCE series has long lifetime, can work as long as 10 years in normal working conditions. 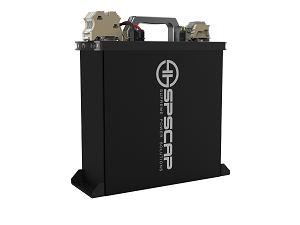 These supcaps modles featured by compact、fully enclosed splash proof design，over 1,000,000 duty cycles and high power density,are ideal power supply as the backup power to the pitch control system of wind turbines.